Are you an information fiend or just love learning new things everyday? The world of Wikipedia is an amazing place where you can search for and browse through millions of pages of information on just about any subject you can think of. 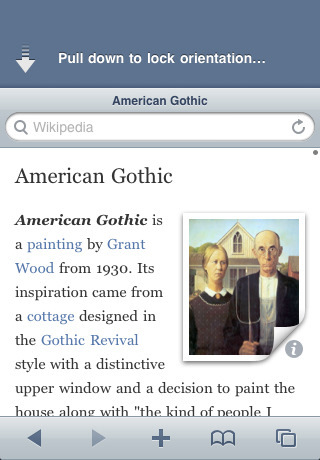 The Articles iPhone app from Sophiestication Software is an Encyclopedia of sorts that lets you browse and search Wikipedia articles from your iPhone or iPod touch. The app comes with some helpful features that make using Wikipedia on your iPhone a more enjoyable and seamless experience. Since most of the time you’re looking to pinpoint some piece of information rather quickly, having something like Articles on your iPhone can make things a whole lot smoother. Using the search box on the main landing page of the Articles app, start typing in what you’r looking for. The app has a search-as-you-type feature that can save you from having to type out entire words or phrases, which can be a great time saver, especially with long words, or phrases that you can’t quite remember the spelling of. You can narrow your search criteria by either the title or the full content of the Wikipedia article. You can scroll through a list of search results -each with a short preview text- and tap any article to get to its full page. Multiple languages are supported by Wikipedia and Articles makes switching from one to anther a breeze. Just tap the languages button and pick from the nicely categorized list of choices. To make reading easier you can rotate the iPhone or iPod touch and Articles will gracefully redraw the page you’re on to fit the screen. For those who don’t want that feature, just pull down on the screen to rapidly change between locked and unlocked orientation. The only annoying part about this is that you have to be on the top of the page to perform the action which makes it a little cumbersome when you want to unlock the orientation and rotate to read in landscape mode when you’re already half way down a page. Another good feature of Articles is easy zooming on article text. Articles supports pinch/zoom for making the font sizes larger or smaller on the fly. Considering the limited iPhone screen real estate, this is a killer feature to have while reading. The buggy part about this feature is that when you zoom in or out, you lose your place in the article and have to scroll up or down to find out where you where. If the developers figure out a way to fix this issue it would be great. Tapping images loads them up inside a new pop-in window that shows them zoomed in along image with details. Articles, like the native Safari browser supports bookmarks and multiple windows. To easily get back to something, just tap the + icon and save it as a bookmark. You can even create folders to organize them. Opening multiple windows is again similar to the Safari interface by tapping the two window icon on the bottom right and tapping “New Page” where you can search for a new article. Articles also gives you back and forward navigation buttons to move around. Finally, hidden under the bookmarks section you have the ability to find “nearby” articles in Wikipedia, and also load up a random article to read. If you prefer, you can also shake the iPhone to get to a random page on Wikipedia. Overall, Articles is a wonderful and fast loading reference utility for the iPhone, with a clean and familiar user interface that would be a great resource for anyone to have. Especially useful for students, researchers and anyone who has a thirst for knowledge. AppSafari review of Articles The Wikipedia App was written by Joe Seifi on March 17th, 2010 and categorized under App Store, Featured, Reference, Search, Utilities. Page viewed 5219 times, 2 so far today. Need help on using these apps? Please read the Help Page. How is this any different than the mobile version of the website?